Our twenty questions series continues with Spider Monkey artist Jesse McManus. Here’s what I wrote about Jesse while DOMINO was serializing his KEYHOLE (part 1, part 2) series online: Many people probably know Jesse’s work from his incredible page in Kramers Ergot 7. I feel lucky to have corresponded with Jesse about art through mini comics and zines for years when we were both a little younger—I got my first letter from Jesse 7 years ago. I’ve been roommates with Jesse twice now, and each time I’ve learned a lot from him. I would often come home late at night from my job that ended at midnight and find that J had just started to dig in and draw, as he usually stayed up until 6am working on comics. Something about how Jesse structured his days around drawing, and the pleasure he got out of it, has stuck with me for a long time. I always feel like, even though the art we make couldn’t be more different, we share a very similar love for comics—if I ever get down on comics, a talk with Jesse always does me good. Since we ran Keyhole, Jesse has released two stellar books–Spider Monkey from DOMINO and the jaw dropping Violence Valley from Floating World Comics. 1. can you describe your drawing routine—how often you draw, how many hour per day—how you break up the day with drawing? i dont have a set drawing routine, but its something i do every day for as much time as i can muster. i really prefer drawing at night, since you lose a sense of time, so when i’ve had the opportunity (through unemployment most often) to really focus on drawing i become very nocturnal. drawing during the day makes it easier for me to log the time, which can sometimes kill the fun of the process via clock-watching. 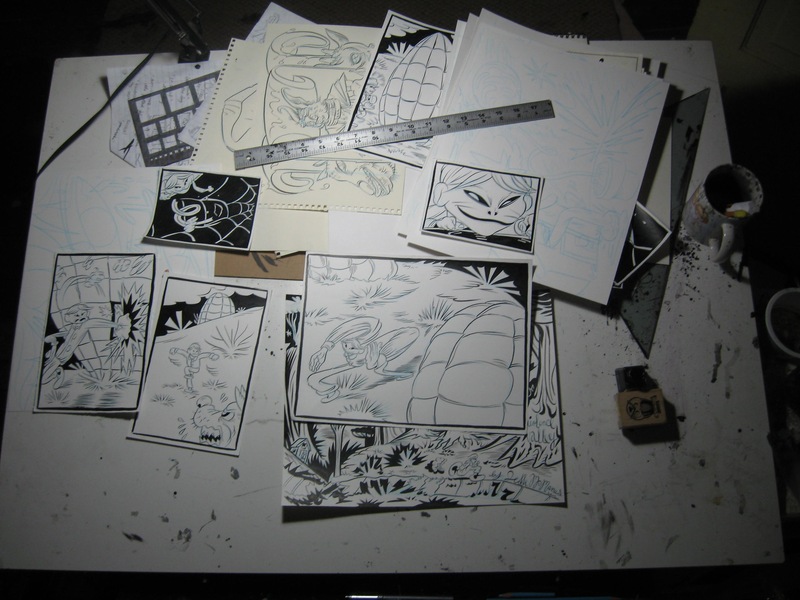 a page usually takes me between 4-8 hours to get sick of and relegate to the finished pile or the scrap heap. but when the story is really going, the pages come faster, though the story demands more time since you’re already lost in it. pinned up on a wall though, i get some perspective. i stare at these things and make an internal list of irritants. i love moving the pages through various phases and letting them co-habitate with their partners in crime until the story refuses to be worked on any more. 2. how much revision/editing do you do in you work? i probably do a decent amount, but sometimes i end up without any paste-ons or white-out. it really depends on how good i feel about the mistakes that do happen and which ones make me itch enough to fix them, and this back and forth discussion is different for every page. 3. talk about your process—do you write a script or make up the drawing as you go? last year i worked on 4 small projects, of which 2 were fully scripted. i had worked for several years with no scripts, chasing narrative confusion like a wet dog! but then the pressure of nothingness becomes a wall to hammer against! you’ve gotta be more than willing to greet the void. the improvisatory high-wire is not as present when you have your scenes listed, which is a freedom, but also a restriction. like a to-do list from hell, but it can help you relax and sit down to work, since you’re prepared. it’s nice to be able to check-off items. alternately, it’s nice to have three chunks of improvised story that you trust innately floating slowly around your walls while you try to bind them together through the sweat of a self-imposed intuition-fever. that’s maybe where i feel happiest and most excited, but it feels like the most slippery slope for anyone harboring notions of a social life or a solid meal or clean clothes, because of the time demanded by the story in progress. if you can script a comic, you may be able to script your life as well, which may be the path to clean laundry and emotional well-being. but i’m as skeptical as i am stinky, so thumbnail drawings are a nice middle ground, as far as non-collaborative work is concerned. 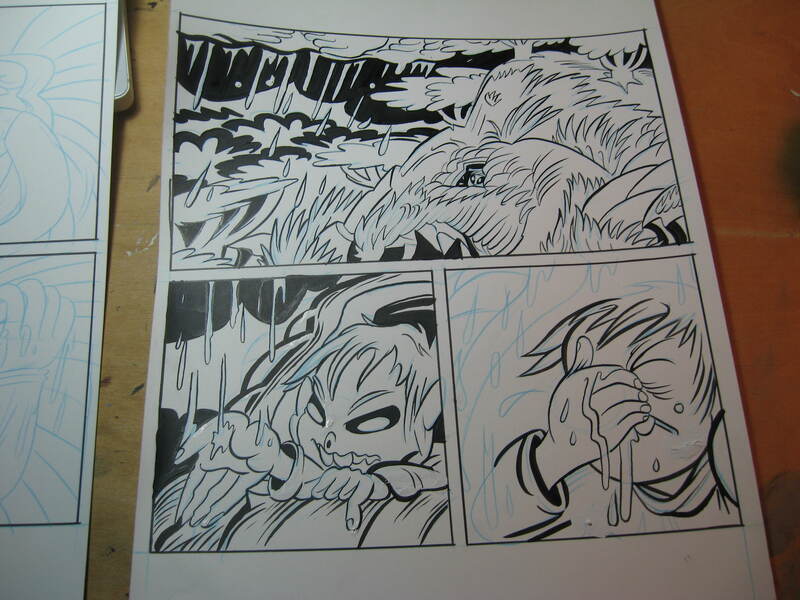 4. do you compose the page as a whole or do you focus more on individual panel composition? i try to oscillate between the two at a healthy rhythm, to balance out the determined actions and the surprises. if i can keep myself interested by not nailing my feet to any one component of the comic for too long, there’s a better chance i’ll end up finishing it while somewhat enjoying myself along the way. 5. what tools do you use (please list all)? i have a small home scanner, but i deal with big pages at the iprc (iprc.org). i tend to build up a pile of 10-15 pages and then roll them up in my backpack and bike downtown. then i put them on a flash drive and bring them home and clean them a little in photoshop. i scan straight in b/w so the blue pencils, gouache layers and pasted-in edges disappear. i haven’t worked with much color or tones lately, though that is quietly changing. i will adjust lettering in panels or clean specks of crap, but i don’t do much more digital adjustment than that. i try to do as many final changes on the actual page as possible before scanning, totally out of tactile preference, not any set of purist principles. 6. what kind(s) of paper do you use? it’s nice cause it doesn’t bleed with nibs, you can cut it in half for perfect letter sized sheets, you can easily rule out a standard comic-book size page without too much calculation or paper-waste. it’s just so stupidly expensive, but i guess the cash sacrifice can put the pressure on to make the pages count, and it’s worth it to be able to use the tools i love without the complaints of badly made paper. 7. do you read a lot of comics? are you someone who reads comics and then gets excited to make more comics—or is your passion for making comics not linked to any particular love for other comics? i grew up reading any comic i could get my hands on, totally obsessed. in the last few years, i’ve become less voracious about reading them, but have drawn more. i feel disgusted after every comics page i finish and i think this is not about the work, but about not wanting to read comics. i love the process but as soon as i’ve made the page fully legible to myself, i get the disgusting feeling that i’ve been pushed out of the room. i think this is a good thing, since it keeps me from being too neurotic about any one page. even if the page doesn’t need me, the story still does. but when the story is finished, this feeling goes from pushed out to locked out. i think the book format serves as a key, and it’s a relief for me whenever someone goes into that room by reading the comic and comes out to tell me what they saw, so we can compare notes. 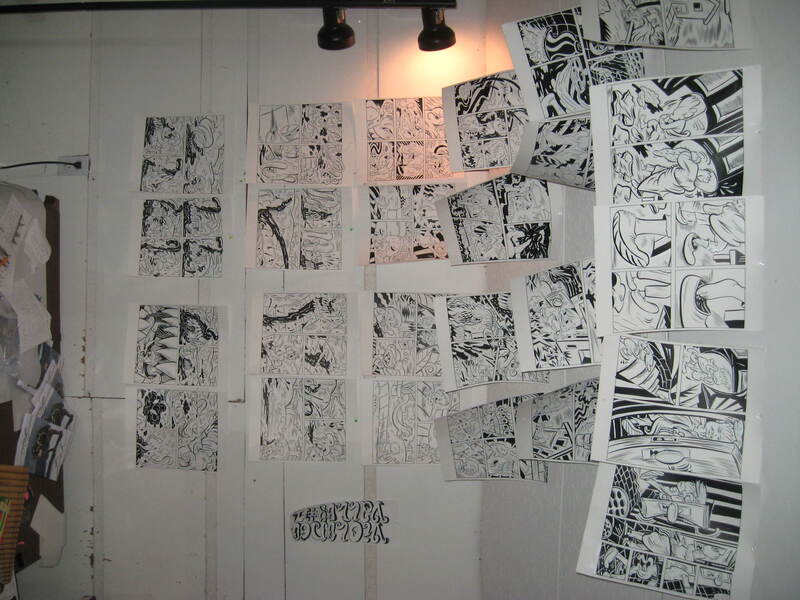 but the practice of drawing comics comes directly from groping through that swarm of them that i piled up through my life (and left behind when i moved away from home) trying to find the coolest thing. getting excited by reading something that makes you itch to draw so you pass some threshold and start doing it. it just happens that my thresholds lately have been more about trying to redefine comics for myself by making, rather than direct inspiration from reading them. 8. do you make comics for a living? if not, how do you support yourself, and how does this relate to your comics making process? i’m not opposed to making money from comics where i can, but i’ve never been able to support myself with it. lately i’ve been working at a local animation studio here in portland. i was hired as a character designer for an ad proposal, but once that work was finished i stuck around and took any work they could give me, which has been mostly production assistant tasks. it’s an exciting place because they do mostly stop-motion with puppets and structures. i’ve been tearing down big sets and helping build small props out of foam, wood and plastic molds. i often try to think about comics in tactile terms, how solid or flexible the characters or their environment are, so working with raw materials as a job will probably make me think differently about drawing. from my position, the production schedule at work is often frantic for weeks before shrinking into temporary unemployment. my current goal is to work hard for them when possible and then maximize the attendant nothingness with personal comics projects. 9. do other artforms often seem more attractive to you? i get more inspiration from writing and music than comics, but again, i may have reached a threshold for comics reading lately. but that egg will crack. my elementary school and college curriculums were focused on interdisciplinary skills, letting you do knitting, video-making, field-recording or whatever next to your drawing interest. it’s hard to say that comics are more attractive than other mediums for me, but it’s hard to ignore that they’re the medium i focus on the most. so i like working in animation for a change, i like the feeling of being in a theatre with a bunch of people who are together and alone at the same time. the energy release of playing loud music with friends in a small space is also really great. but i love the 1-to-1 relationship that happens with people and books. 10. what artwork (or artists) do you feel kinship with? in comics, i often think of dead ringer by jason t miles and somersaulting by sammy harkham. dead ringer i love re-reading, despite and maybe because as a book it’s a confrontational, uncomfortable object to have around. it has a hard time hiding on any coffee table, but it’s narrative thrust relies on keeping something private while still existing as an artifact of some dark admission or gut-spill. 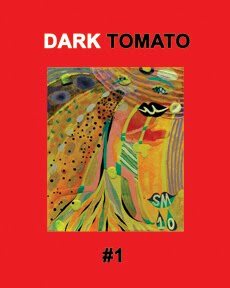 for such a vulgar-seeming comic, it is loaded with a quietly intense breed of self-respect. it’s like a guidebook for self-assurance in the school of catharsis through applied ink. somersaulting because with it’s tight grid and big-footed teenagers who drank and got bored and failed at love, it made me want to abandon everything and draw comics non-stop. totally epiphanic for me, the deep feeling that i had been looking for this comic for a long time. it’s a totally different strip than dead ringer, but it gave me the same chills in my spine. both are full of texture, but shock you with how fast you can blow through them, making them rabidly re-readable: an unsung virtue of the comics medium, i reckon. both made me want to actively change my reality. both have strong emotional tones which are hard to pin down or explain. they both seem at ease with and even empowered by that ambiguity. otherwise, the kinship i feel with werner herzog movies or robert walser and donald barthelme books seems tied to a thick sense of humor and interesting shifts in scale and duration. i love a manic farce, a pan-faced rampage. the thrill of verbal absurdity chained to heavy skepticism and body-horror. a confused melancholy that takes it’s time, locked to high-pitched, skin-ripping hilarity with a low, deeply angry core. work that compresses and expands and is measured only by a barometer of it’s own design. 11. is a community of artists important or not important to you? when i’m drawing it’s a chance for me to disappear, or process things while being very alone. when you spend enough time doing that, it’s nice to know there’s someone to talk to. i do feel connected to a sprawling circle of friends and heroes, but comics are most exciting to make when i’m very isolated, even if this isolation is self-imposed or delusional. i think that kind of time away from a social reality can help you appreciate what friends and family you have. that said, i think the internet is hugely essential but also damaging to my sense of community. maybe because my favorite kinds of humor are hard to translate onto the web. you know, stuff with tongues waggling, repetitive phrasings, sincere puns and liquid wordplay. that stuff is always more fun when you can hear someone snorting and giggling like a confused pony, before you wipe their spit off your sleeve and sock them in the pooch with another bad gag. 12. Is there a particular line quality you like—thick/thin/clean/etc? i find that i like looking at rough lines but i like making clean lines. this is subject to total reversal and infinite change, depending on the weather and the contents of my stomach. 13, what is more important to you—style or idea? 14. is drawing a pleasure to you or a pain? 15. when you meet someone new, do you talk about being an artist right away? do you identify yourself as an artist or something else? i identify as an artist, but i think that can simply imply someone making creative decisions and claiming them with a vague label. with this outlook, it becomes a nicely general position to fill that is basically open to everybody. meeting someone new, i would be more inclined to ask about their health, or the health of their pets. if that person is aware of their innate creativity, and actively pursues it, they may have as much love for a current project or obsession as any so-called non-artist may have for their phantom limb or sick goldfish. in which case, i’d be happy to discuss it. 16. do you feel at all connected to older comic artists like steve ditko or jack kirby—or does this seem like a foreign world to you? i love ditko and kirby, but they will always be a harder nut for me to crack than the early newspaper cartoonists, who seem to have done everything properly from scratch, while those future champs were still wearing short pants, or no pants at all. 17. do you ever feel the impulse to not draw comics? yes and it is equally depressing and refreshing, despite being short lived. 18. do you draw from life? not often, but i recently took a trip with my dad to the biosphere in arizona and used life-drawing as a shield against the noxious tour-guide. it was only semi-successful then, but usually it’s a great way to build muscles and feel connected to things. 19. do you pencil out comics and then ink? or do you sometimes not pencil? with pencil – rule out basic page margin, rough in loose panels or strong ones if i know the layout of action, write in sloppy words if i have some, try to nail as many crucial components (faces, postures) as i can, get the thrust of the thing down, without going overboard. i’m excited to ink, but i know that i enjoy inking with a thought-out shape or decisive pencil-line to run over. with pen nib – ink everything that is asking for it, including some scaffolding (like structural or textural stuff) but ignoring solid black shapes. then begins the process of pasting over and gouaching-out excess, then working back in with pen or brush. there are usually 1-3 passes in this phase, less if i can help it. i rarely go back in with pencil after that first inked attempt, unless i’m drawing a whole new panel, which is rare. i’m more inclined to draw the whole page over, and in the cases where i do, it’s often better for it. inking the panel borders is usually either the first or last step, done with disposable technical pens lately, since they don’t smear and drip when i stubbornly decide to make a vertical line after ten minutes of being horizontal. 20. what does your drawing space look like? 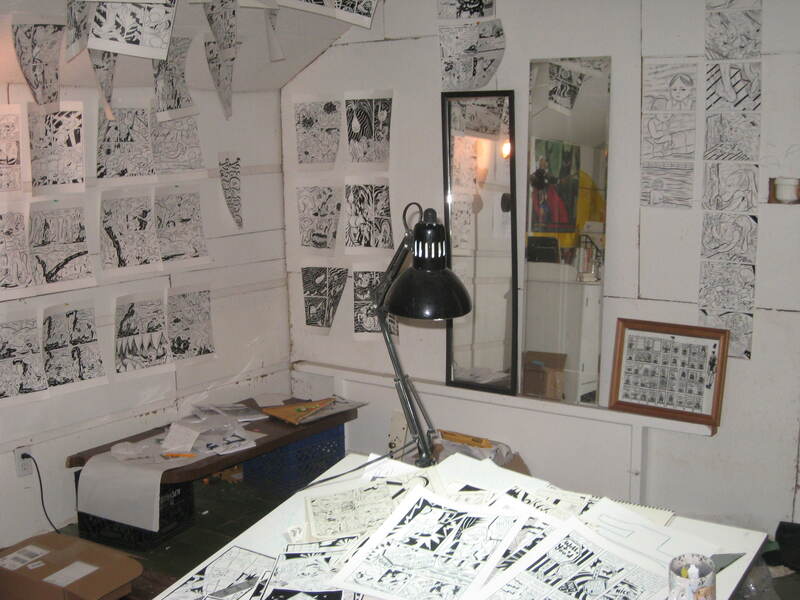 this was my drawing space from last year when i was working on violence valley and keyhole and had started work on spider monkey. the photo of the work in progress is a rejected page from violence valley. i live in a different place now but after the howlidaze this room is seriously outta control, beyond any hint of being photogenic. i hope you’ll forgive me including old photos from when i was young and lustrous. Great, Jesse!! I love all this stuff and it’s really interesting to see your creative process. I always thought you’d make it! Go on! i will soldier on, alberto, with your blessing. thanks for reading!